Help! is the title of the fifth British and tenth North American album by The Beatles, and the soundtrack from their film of the same name. 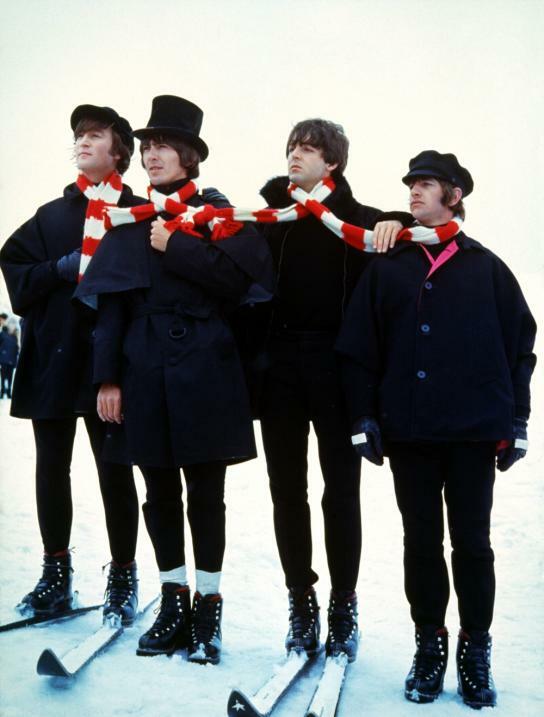 Produced by George Martin for EMI’s Parlophone Records, it contains fourteen songs in its original British form, of which seven appeared in the film. 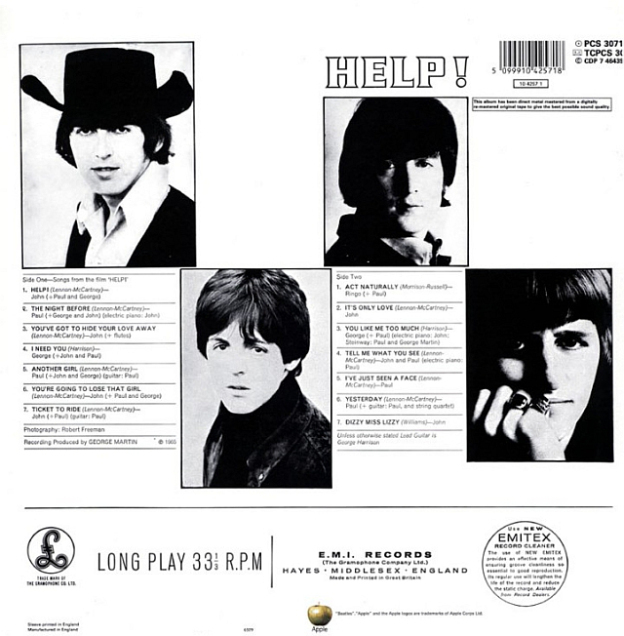 These songs took up the first side of the vinyl album and included the singles “Help!” and “Ticket to Ride”. The second side contained seven other releases including one of the most-covered songs ever written, “Yesterday”. 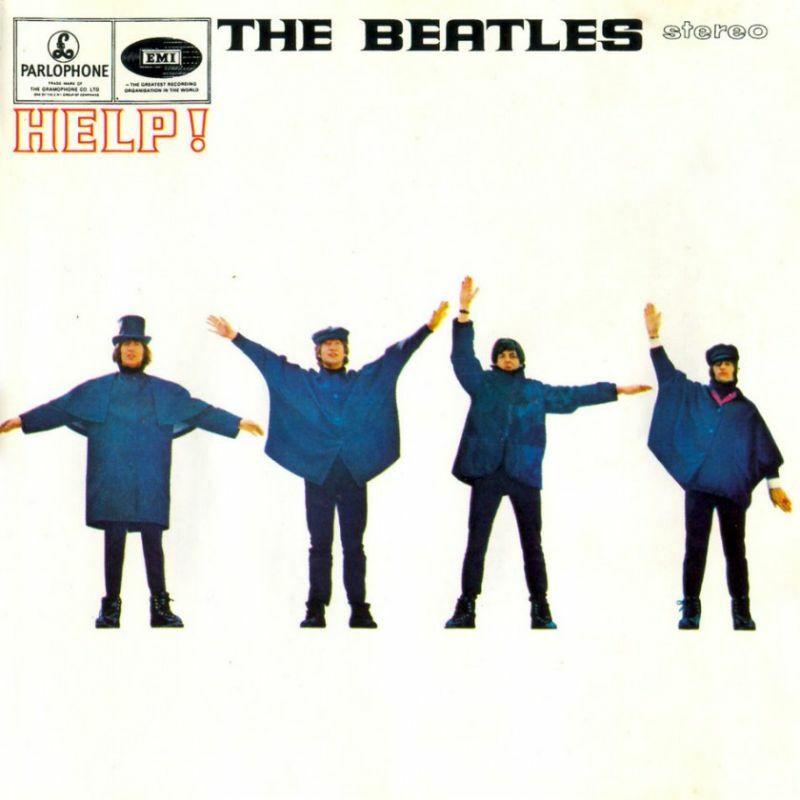 When “Help!” came out in ’65, I was actually crying out for help. Most people think it’s just a fast rock-‘n’-roll song. I didn’t realize it at the time; I just wrote the song because I was commissioned to write it for the movie. But later, I knew I really was crying out for help. It was my fat Elvis period. You see the movie: He — I — is very fat, very insecure, and he’s completely lost himself. And I am singing about when I was so much younger and all the rest, looking back at how easy it was. Now I may be very positive — yes, yes — but I also go through deep depressions where I would like to jump out the window, you know. It becomes easier to deal with as I get older; I don’t know whether you learn control or, when you grow up, you calm down a little. Anyway, I was fat and depressed and I was crying out for help. Considering that Help! functions as the Beatles’ fifth album and as the soundtrack to their second film — while filming, they continued to release non-LP singles on a regular basis — it’s not entirely surprising that it still has some of the weariness of Beatles for Sale. Again, they pad the album with covers, but the Bakersfield bounce of “Act Naturally” adds new flavor (along with an ideal showcase for Ringo’s amiable vocals) and “Dizzy Miss Lizzy” gives John an opportunity to flex his rock & roll muscle. George is writing again and if his two contributions don’t touch Lennon and McCartney’s originals, they hold their own against much of their British pop peers. Since Lennon wrote a third more songs than McCartney, it’s easy to forgive a pair of minor numbers (“It’s Only Love,” “Tell Me What You See”), especially since they’re overshadowed by four great songs. His Dylan infatuation holds strong, particularly on the plaintive “You’ve Got to Hide Your Love Away” and the title track, where the brash arrangement disguisesLennon’s desperation. Driven by an indelible 12-string guitar, “Ticket to Ride” is another masterpiece and “You’re Going to Lose That Girl” is the kind of song McCartney effortlessly tosses off ….